At ACS Industries, we are the world leader in engineered knitted wire mesh solutions. We were founded as American Copper Sponge in Rhode Island, USA in 1939, where we manufactured knitted copper sponges. Seven years later, we introduced our first knitted wire mesh air and grease filters. 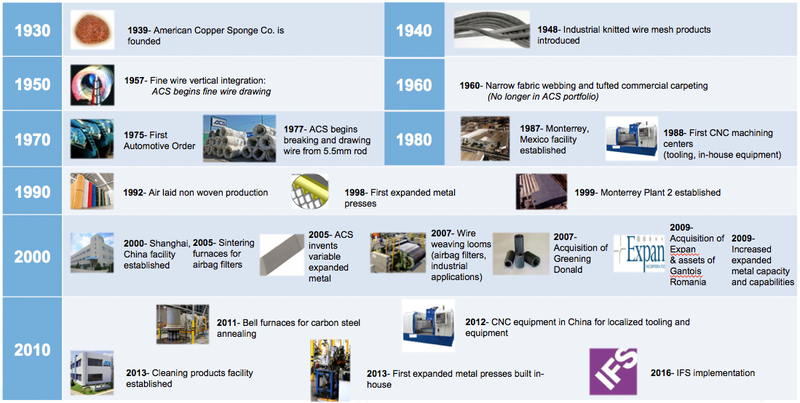 As a result of the heavy growth in the knitted wire mesh business unit, management changed American Copper Sponge to ACS Industries, Inc. in 1960. Since the 1970s, we expanded our production into automotive exhaust products, and introduced our first knitted wire mesh support systems. Today, we are the world’s largest vertically integrated knitted wire mesh manufacturer. Additionally, we are a key global supplier of pyrotechnic airbag inflator filters and exhaust systems components to both Original Equipment Manufacturers (OEMs) and Tier 1 suppliers. Furthermore, we are a global supplier to both the foodservice and janitorial industries. As a leader in knitted wire mesh technologies, we can tackle our customers’ most difficult and important projects. As a result, we provide solutions that are competitively priced and have short term lead times. Due to our quality control measures and standards, we have extensive experience with automotive OEMs and Tier I Suppliers. We are a multinational organization that serves customers on every continent. In addition to both our headquarters and industry-leading Research & Development center in Rhode Island, USA, we have production facilities in Shanghai, China; Monterrey, Mexico; Turda, Romania; and South Carolina, USA, as well as regional sales offices located throughout the world. We are in our fourth generation of family leadership, with actively involved owners. Our manufacturing facilities in China, Mexico, Romania and the USA total over 1,000,000 sq ft.
We are the world’s largest vertically integrated knitted wire mesh manufacturer. Our process is holistic: we purchase ‘raw’ wire rod in various alloys and draw it down in-house to fine diameter wire. We choose to follow this process instead of purchasing ‘finished’ fine wire. This model allows us to have direct control over both our raw material supply and finished product capabilities.